What's your favorite piece of geek clothing? – AiPT! What's your favorite piece of geek clothing? What’s your favorite piece of geek clothing? Don’t worry – we’re not trying to steal your style! But we genuinely want to know what your favorite piece of geek clothing is. And to show how serious we are, here are a few members of the AiPT! team with their own favorites! I have a serious problem with T-shirts. In the way that I love buying them far too often. It’s the one piece of clothing that I will consistently frivolously spend money on. Just a few days ago, I held my annual T-shirt event, where I pick out 8-10 of the ones I wear the least and stash them in a storage container in my closet (you never know). Currently, I’m wearing a lot of wrestling shirts but that’s mainly because we just got done with Wrestlemania season. The grandest stage of them all aside, I’m going to have to go with the shirt my sister gave me for my birthday. Eight-bit Star Wars characters! 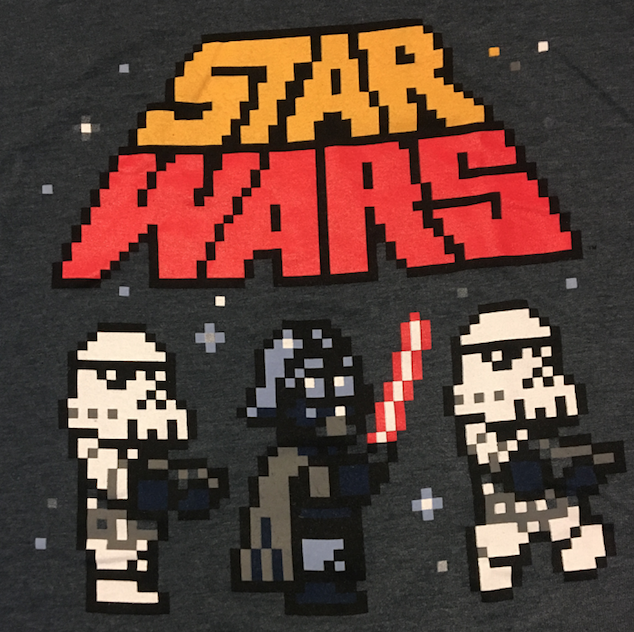 Not only does it satisfy my unending love of Star Wars but it also hits on my love of 8-bit video games. Bravo sibling, well done. Despite my overwhelming abundance of geek related T-shirts and sweatshirts, I think one of my favorite geeky wearables at the current time is a pair of socks that I own. These socks, by Stance, are high-quality, comfortable socks. They are made to form to your feet and will not fall apart easily. The designs are often top notch as well. The two pairs that I own are both Star Wars-related. The first set I got was the BB-8 socks because he’s one of my favorites and I love his design aesthetic. The second set I picked up at Star Wars Celebration and these socks are the epitome of subtle. They represent the Lars Homestead with the twin suns setting the stage. So, whenever I’m in the mood to go geek but want to be subtle about it, I pull on my geeky socks. I love a good T-shirt as much as any geek, but my true nerd passion is accessories. Give me some bling with a nerdy turn and I am in heaven. I don’t have my ears pierced, but I have a ridiculous number of nerdy necklaces and bracelets. I love ones that can both pass as normal jewelry and are super nerdy. Here are three of my faves in one picture: All three of these items are actually from the same fandom: Agent Carter. Ever since I saw the first Captain America movie, I’ve been in love with Peggy Carter and immediately wanted to cosplay her. Peggy fans are a determined bunch and we are lucky enough that the costume designer is a fan of cosplay and likes to let us know where she sourced items. So the number one item for Peggy fans is her lipstick: Besame Red Velvet. The necklace is a fan-made duplicate of one Peggy wears on the show, the Carter family crest. But my favorite is this bracelet. Sparkle! Designs makes bracelets, necklaces, mugs, and more that feature quotes from all kinds of fandoms, from Marvel to Disney to musicals like Hamilton. Wearing this bracelet makes me strong and reminds me why this character resonates with me so strongly. There you have it – just a few of our favorite geek wearables. Now, it’s your turn. Share your favorite items in the comment space below!